Two teams that have battled through difficult league schedules are set to battle in the Class 5A quarterfinals. St. Thomas Aquinas, a member of the Eastern Kansas League, has suffered losses to Bishop Miege, Blue Valley and Pittsburg. All three teams are still alive in their respective classifications. The Saints won the district championship under the direction of former Hutchinson head coach Randy Dreiling. Aquinas finished just 3-7 a year ago. The Saints are battling injuries to their top three running backs including 1,000-yard rusher James Cosentino who was lost for the season in Week 9. Kyle Bollig stepped up and rushed for 138 yards during last week’s win over Bonner Springs. Quarterback Karter Odermann ran for 115 yards. Leavenworth, a member of the Sunflower League, dropped games to Lawrence, Olathe Northwest, Olathe North and Shawnee Mission East. The Pioneers enter on a four-game winning streak and picked up the school’s first-ever playoff win by defeating Topeka Seaman 35-6 in the first round. Sanchez Williams let the Pioneers against Seaman with 273 yards and three touchdowns. On the season, Williams has rushed for more than 1,000 yards and 12 scores for Leavenworth. Quarterback Landry Hodges has thrown for 849 yards and nine scores. 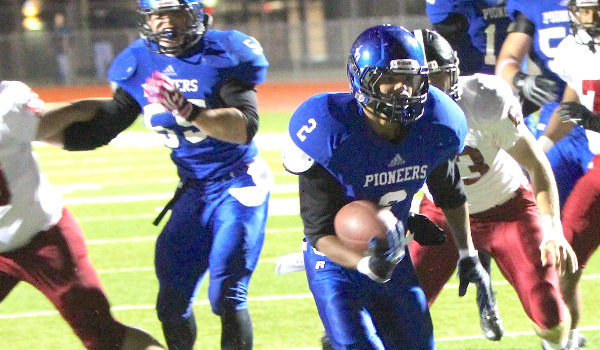 Isaiah Ross is the Pioneers’ top receiving threat with 459 yards and five scores. Ross has also rushed for 537 yards and five more touchdowns. The Pioneers got a boost a couple of weeks ago from the addition of Drew Sachen, a junior transfer from Immaculata High School. Sachen was a Kpreps all-district selection at QB/LB for the Raiders a season ago and just became eligible at Leavenworth after switching schools last spring when his father Sean was added to the Pioneer coaching staff. The Shawnee Heights Thunderbirds and the Pittsburg Purple Dragons will meet for the first time with a spot in the state semifinals on the line. Shawnee Heights opened the season with a 1-4 record after losses to Manhattan, Blue Valley Southwest, Topeka Hayden and Emporia. However, the T-Birds pulled off a 28-21 upset in overtime over previously unbeaten Topeka High and haven’t looked back since. Heights enters this matchup on a five-game winning streak. Tony Barksdale Jr. rushed for about 220 yards and three touchdowns during the T-Birds’ playoff win over Lansing last week. Barksdale has rushed for 1,566 yards and 22 touchdowns on the season and eclipsed the 200-yard mark in three consecutive games. T-Bird quarterback Camden Wheatley has thrown for 1,715 yards and 17 touchdowns while adding 332 yards on the ground. Pittsburg boasts one of the top athletes in the state with senior running back and safety Alex Barnes. The senior, who has verbally committed to Kansas State, has rushed for 2,211 yards and 35 touchdowns on the season. Barnes rushed for more than 300 yards and six touchdowns during last week’s playoff win over Mill Valley. Pittsburg dominated the Southeast Kansas League and its only loss came 14-12 to district foe Blue Valley West. The Dragons are solid on defense and will need to limit the explosiveness of Barksdale to advance. Shawnee Heights will look to contain Barnes and force Pittsburg in second and third-and long situations. Back in Week 4, top-ranked Bishop Carroll blasted then No. 2 Wichita Heights 70-15. Since, the conversation surrounding Class 5A has switched from whether any 5A team can challenge the Golden Eagles this season to whether any team in the state would have a shot, regardless of classification. Some have even suggested, jokingly we hope, that even the Kansas State Wildcats might be a slight underdog against Alan Schuckman’s group. The Eagles have been dominant. They’ve outscored their ten opponents 546 to 51 this season. Waiting for the Golden Eagles in the quarterfinal round is those same Wichita Heights Falcons; no doubt eager for another shot. Heights won four straight after the loss to Carroll, and then dropped a 17-14 decision to Kapaun Mount Carmel in district play. The Falcons opened the playoffs last week with a tough, 10-7 win over Salina Central . In that game, Luis Rodriguez’s 25-yard field goal in the second quarter proved to be the winning points. Rodney Murphy rushed for a team-high 102 yards and D’Aunte McPhaul grabbed two late interceptions to secure the win. The Falcons have some talented players in the backfield in Murphy, Tre’ King, Trenton Autry, and Armond McCray, but suffered a big blow when quarterback Garrett Haskins suffered a broken ankle in the Week 7 win over Andover. Since then, Autry has moved to quarterback and the ground game behind has stepped up. Murphy has rushed for 405 yards in the Falcons last three games. But Bishop Carroll’s defense will be geared up to stop the run; something they’ve excelled at all season. They held the Falcons to 60 rushing yards in the first meeting. Carroll, on the other hand, has had little trouble scoring points. Senior quarterback Colton Howell has rushed for more than 550 yards and 12 scores, while passing for nearly 1,100 yards and 12 more touchdowns. All of that has come in limited time because of blowout wins. Denzel Goolsby, a Kansas State-commit, has rushed for more than 1,300 yards and 29 touchdowns. He is also one of the state’s most dangerous kick returners. This game will likely be closer than the 55-point margin from earlier in the season, but the result will be the same. Maize South will host second-ranked Salina South with a chance to reach the 5A state semifinals. The Mavericks have reached the playoffs in each of their first five seasons, but this is their first season in Class 5A. Salina South will try and get to the semifinal round for the third consecutive season after finishing as the 5A runner-up a year ago. Salina South used an opportunistic defense to eliminate Kapaun Mount Carmel for the second consecutive season. The Cougars forced three Crusader turnovers in holding on for a 19-14 win. South was led by junior back Sam Corona who rushed for 143 yards and two touchdowns in the win over Kapaun. The Cougars have been without their leading running backs Eric McCullough and DeAngelo Turner the past two games due to injury. McCullough is expected to play on Friday against Maize South, and Turner may return as well. Corona has been solid in rushing for 218 yards and three scores the past two weeks. McCullough is the Cougars’ leading rusher on the season with 696 yards and three scores. Dalton Wassenberg has completed nearly 60 percent of his passes for 1,621 yards and 22 touchdowns. He’s found Dylan Becker 39 times for 905 yards and 14 scores. Wassenberg and the Cougars may have to spread the field to stretch a stout Maize South defense that is surrendering less than 17 points per game and has registered two shutouts. On offense, Maize South has been banged up in the backfield as well. But one constant has been the play of quarterback Korie Frausto. Frausto is a dual-threat player and played a part in three Maverick touchdowns in the win at Liberal last week. Maize South will need to rely on their defense to victory, but Salina South’s playoff experience may prove to be just enough.